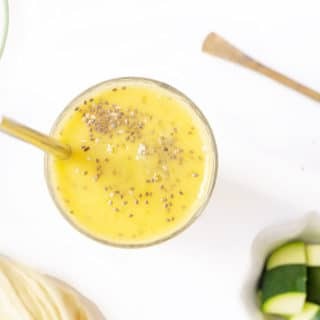 March 12, 2019 by Emily Brees 2 Comments - This post may contain affiliate links. 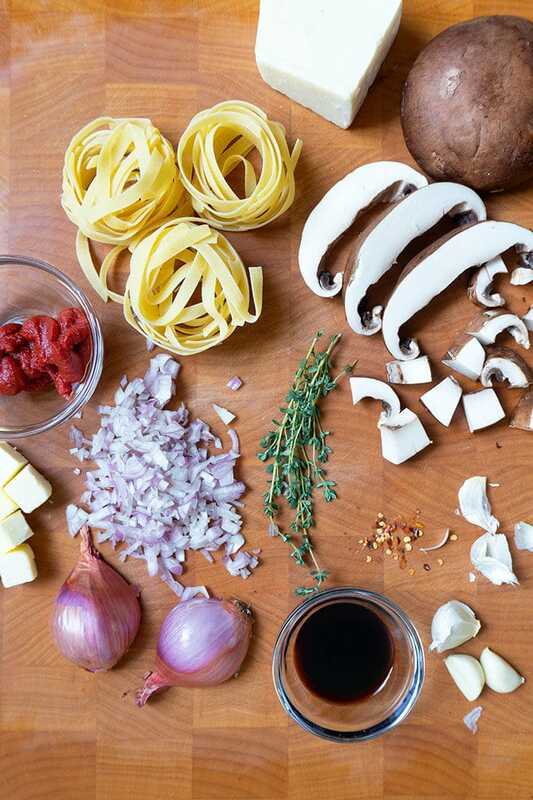 This simple Portabella Mushroom & Thyme Pasta Ragù is made with a base of shallots, tomato paste, thyme and garlic. 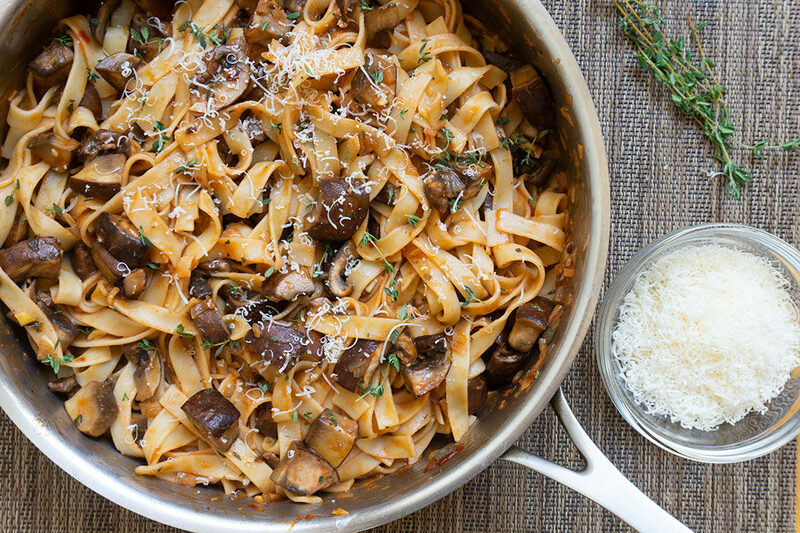 The sauce lightly coats the noodles allowing the mushrooms to stand out in this dish. 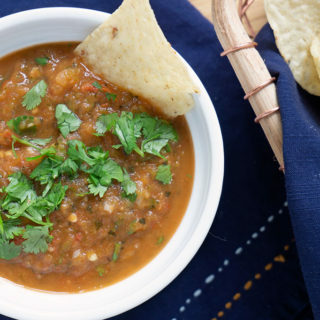 A splash of balsamic vinegar brings out the rich tomato flavor. Is it a sauce or a ragù? What’s the difference? 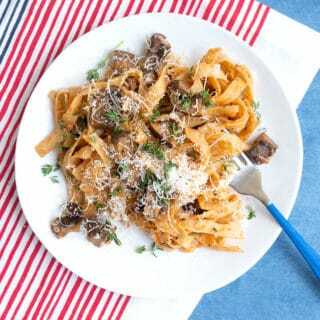 I decided to call this recipe a mushroom sauce, because most of us aren’t doing a Google search for ragù. But officially that is what this is! A traditional tomato sauce has lots of smooth liquid ingredients like tomato puree. 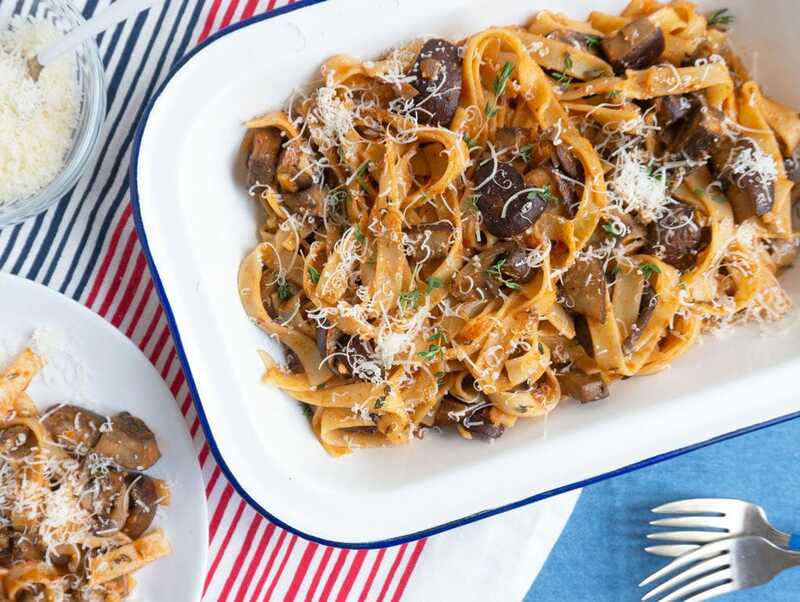 On the other hand, a ragù is typically a chunky sauce, whether it be meat or vegetables like the mushrooms in this pasta recipe. 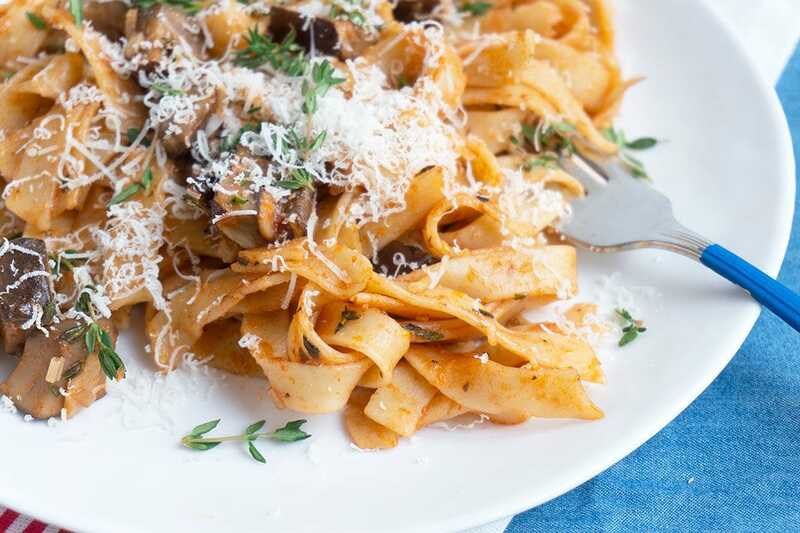 Ragù uses tomato paste to add color and depth of flavor, but it is not sauce-y. Read more at Taste of Italy here. If you’re looking for a traditional sauce recipe, try my Easy Homemade Tomato Sauce here. 2. 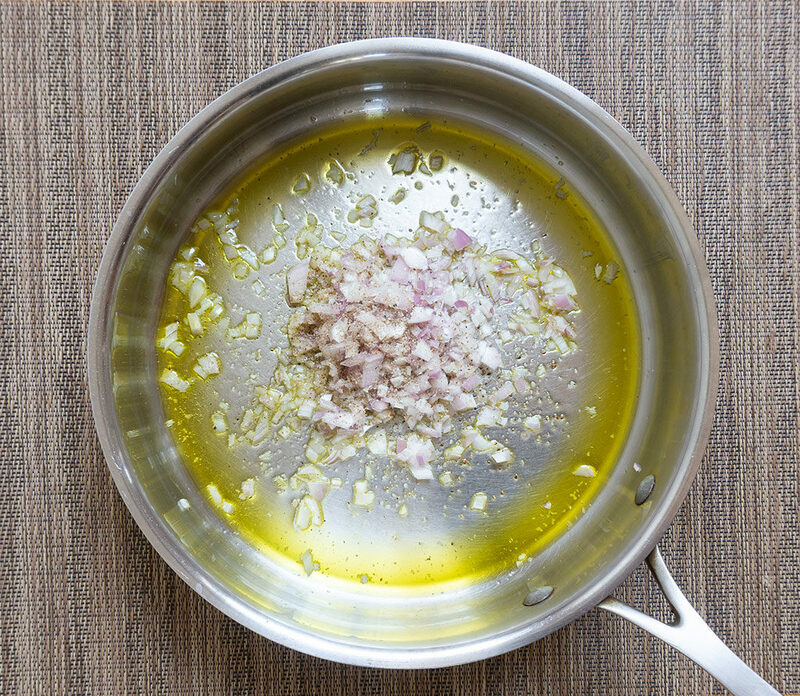 Sauté shallots in olive oil. 4. Add tomato paste, garlic, thyme, etc. 3. Add chopped Portabella mushrooms. 5. Stir to combine. Add pasta water. 6. Add noodles, top with cheese + serve! 1. Like any mushroom, the first step is to clean the mushroom. Never soak mushrooms in water to rinse them. Mushrooms absorb water very easily and this will make them spongy. A quick rub with a slightly damp paper towel will work well or use a mushroom brush. Stems are also removed. 2. Removing the Portabella mushroom gills. This step is up to you. The black gills on the underside of the mushroom can be eaten. However, they can turn your food, especially sauces, a bit murky. So in this recipe, I remove them by scraping the gills out with a grapefruit spoon. One of my favorite qualities about mushrooms is that they are a blank slate for flavor. 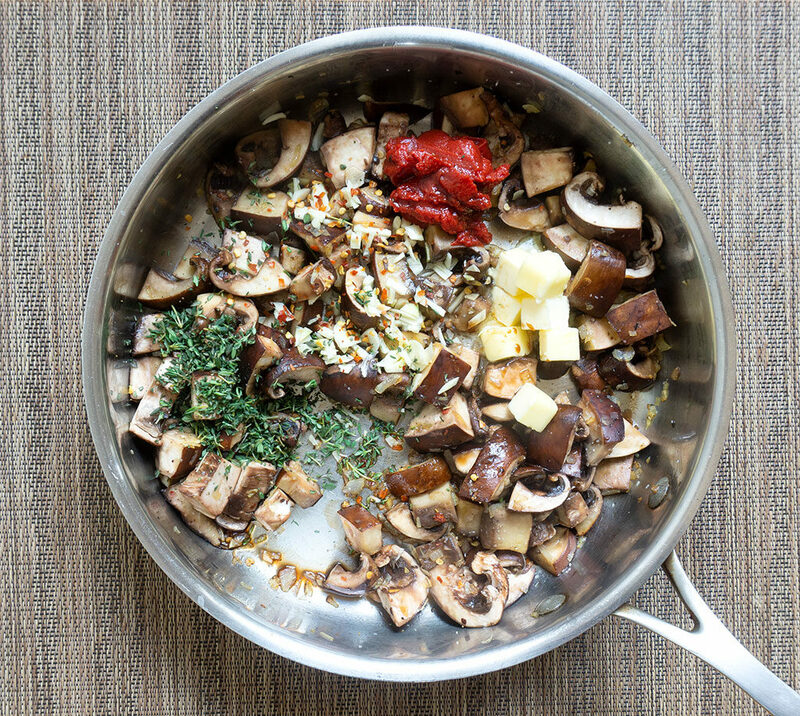 A 30 min marinade is all it takes for mushrooms to soak up lots of flavor. Which makes them perfect for a quick meal like these tacos. 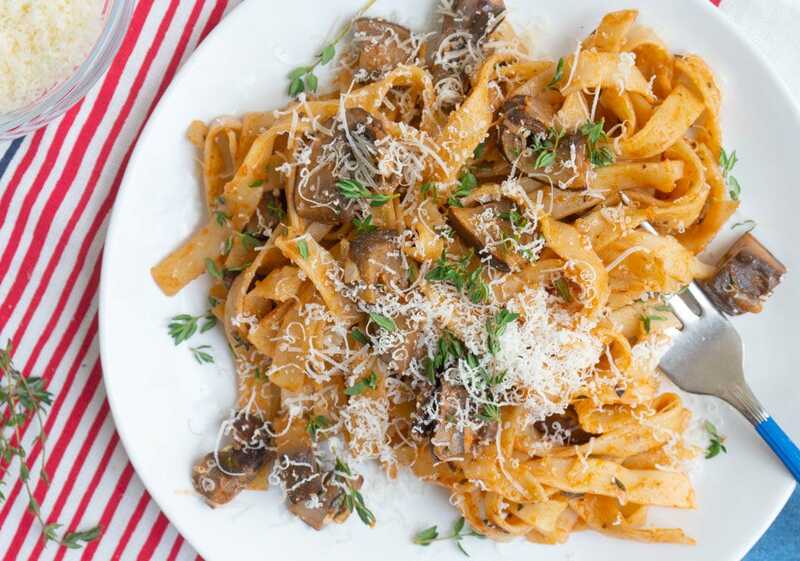 This simple Mushroom & Thyme Pasta Ragù is made with a base of shallots, tomato paste, thyme and garlic. 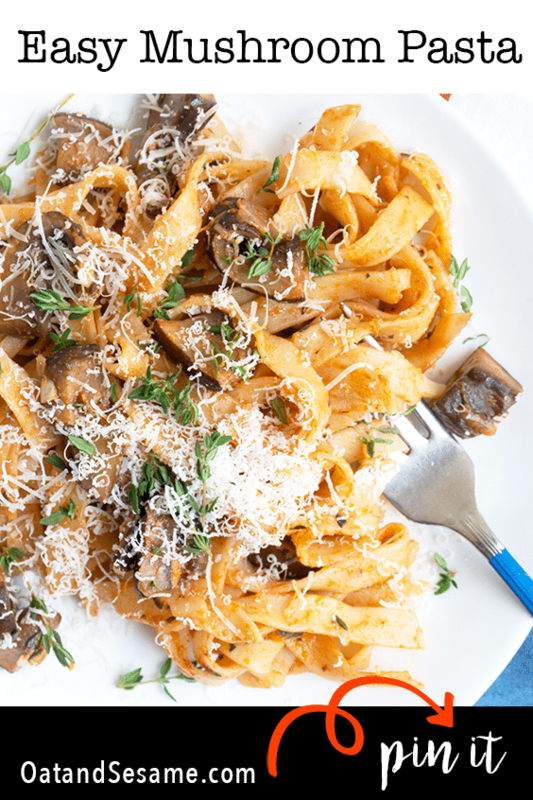 A splash of balsamic vinegar brings out the deep and rich tomato flavors in this mushroom sauce. Bring a large pot of water to a boil and then add 2 tablespoons kosher salt. This salt will flavor the noodles. Cook the pasta until al dente. Scoop out and RESERVE 1/2 cup of the pasta water, then drain the pasta. While your pasta is cooking, heat olive oil in a large skillet over medium heat. Once warm, add shallots and a pinch of Kosher salt and pepper. Sauté, stirring frequently, until the shallots are softened, but not browned. Add the mushrooms to the pan. 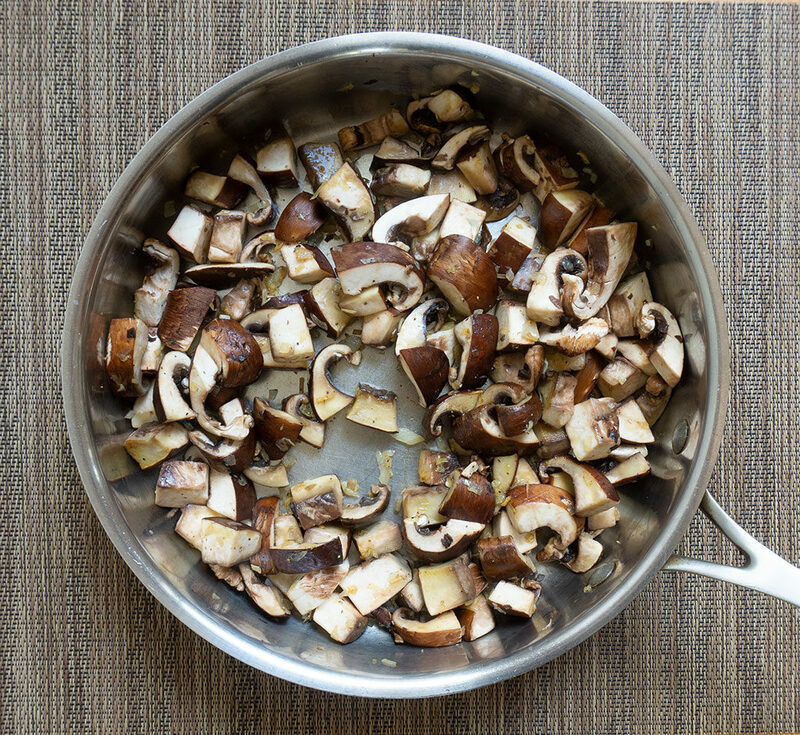 Cook the mushrooms for a few minutes until they start to soften and darken in color. Stir in 1/2 teaspoon Kosher salt. 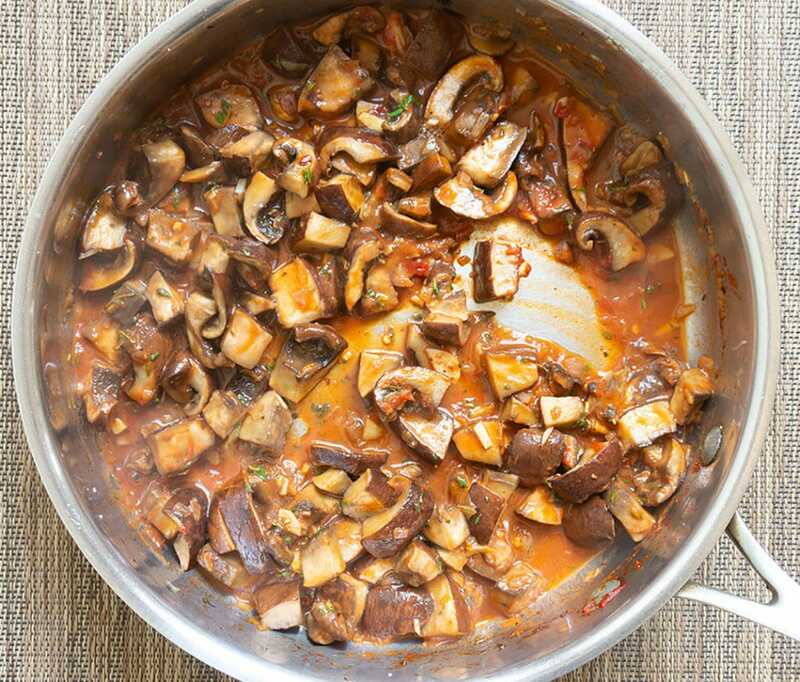 Continue cooking until the mushrooms become tender and their liquid evaporates. Add the garlic, thyme, chili flakes, tomato paste, balsamic vinegar and butter to the mushrooms. Cook for 1 minute. Add the 1/3 cup of pasta water and stir over medium heat until the mixture becomes saucy. Add the cooked pasta to the pan and toss gently with tongs to coat with the sauce, adding more pasta water if it’s too dry. Taste for seasoning. Add grated Parmigiano cheese over the pasta and serve. Oooh this sounds amazing! 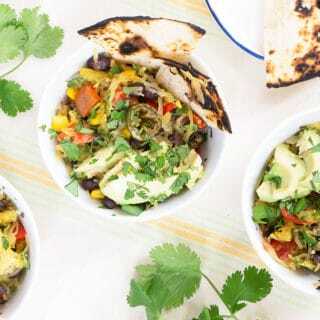 I’m going to make this simple yet savory recipe tonight! Sounds delicious!! Hope you love it Molly!